#UAE as a platform for innovation? A very strong point for UAE, Qatar and some other gulf countries to become strong innovation hubs is the investments these countries have made and are still making in connectivity and communication. With much of today’s business and value chains having turned digital, a good broadband connectivity is essential for any business to grow or even to get started. UAE and Qatar have both heavily invested in fiber deployment over the last couple of years and are now rapidly deploying LTE as well. The connectivity quality has rapidly increased and this facilitates communication and also secures a quality access to the cloud where many of the enterprise resources are located. Similarly regional airlines have also transformed the gulf states into major hubs between east and west cutting distances and facilitating business. In addition education is on top of the agenda for all gulf states. This means also that local talent is fostered and developed. Major Business schools have established in Dubai and Abu Dhabi. So there is a good availability of business people, the shortage today would probably more reside in areas like software development, but these needs could possibly be off-shored to nearby india or some of the arabic countries like Egypt. A number of incubators and accelerators are appearing in UAE and these are great places to launch your company if you have already a ready product and you only need the right coaching and relationships to get your business on orbit. I recently attended the innovathon in Dubai organized by DP World and Turn8, it is great to see this type of event appearing. For the selected teams, the promise is to help them to take their products from concept to launch in 120 days. Similar proposition is offered by In5, an incubator located in Dubai Internet city. Seed funding, coaching, office spaces, go-to-market support is part of the package. The incubators expect in return a certain equity in your company. In order to leverage these emerging infrastructures for accelerating your business the important thing is to be well prepared and almost ready to launch. What seems to be still missing is an environment where people get support to develop early ideas and develop their business plans or even get together to share ideas and provide their skills to other entrepreneurs. Having spent much of my life in Sweden, I want to compare this to the experience I had in Sweden. I exposed one of my ideas to the Stockholm innovation and growth initiative (STING) program in 2006. After the initial pitching and selection based on project description and one-on-one interviews, our team was selected to join the program. That program was setup a bit differently where we got 4 months of training with no equity required. The focus was entirely on business planning and value creation. In addition the program was setup so that it would also suit people that currently have a job or are studying (which is probably applicable to many potential entrepreneurs in UAE). We had 4-6 hours coaching a week, plus equal amount of homework for the next session. Program ended with a monetary prize for the winner and investor pitching for all the participants. Beside this early support where you are still in exploration mode, I am also missing the networking platforms to explore ideas and meetup with like-minded people. I haven’t seen much meet-ups or google hang-outs. The business groups are often more focusing on networking for immediate business opportunities. When it comes to software development and innovation, I think the appearance of hackathons and the platforms supporting these hackathons is also missing in UAE today. On the downside, one of the main issues to setup a start-up here is the actual cost of living. If you want to start you business and cannot rely on somebody to fund you, then it will be difficult to get started. With low-end housing in UAE today at 100-150K AED per year and equal amount needed to cover all your cost of living, it means that you need to have a minimum yearly budget 0f 200-300KAED (60-90k USD). Of course that is not the case if you have another family member covering for you or if you are student or if you are willing to compromise quality of leaving. But you need you will have to get this budget somehow, since these costs are normally not covered by the incubator. New platforms and models for Abu Dhabi, Dubai and UAE? Develop partnerships between accelerators and major companies present in UAE to fully sponsor project teams, i.e. to also cover cost of living in exchange for higher equity. Why not exploring complete new approaches like crowdsourcing? For instance develop a similar platform as kickstarter but based on Islamic funding only. Virtual spaces to hang-out, offer your skills to other entrepreneurs, expose your ideas, build-up your team. Probably my view is a bit biased since it is mainly looking at software innovation, but I would love to hear your opinion. What do you say? Do you want any of these ideas implemented in UAE? Paper.li – More than just trend monitoring, it is a great #BI tool! If I would ask any of us where you get updated about trends, competitors and technology, I bet the majority of you would say through digital media. The problem is how much time are we spending each and every day going through online magazines, blogs, tweets, links just to stay on top of our game? It usually ends-up with many, many hours a week. I have tried out paper.li for a few weeks now and I must say this tool is amazing. The daily editions I have created for my own use have become my default portals for BI information. 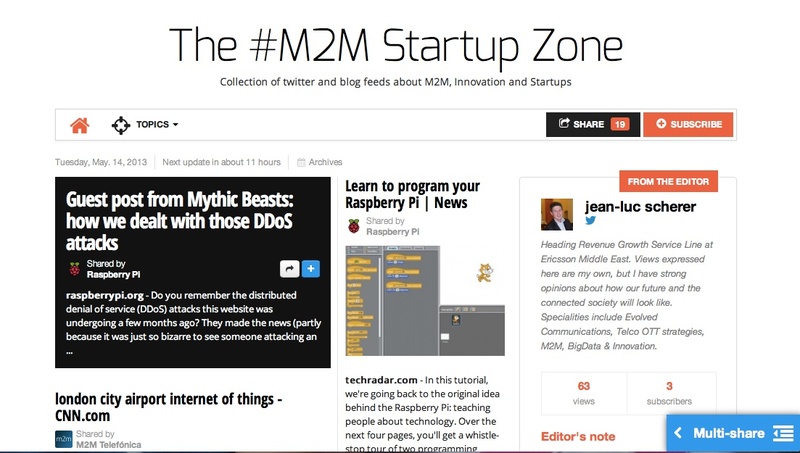 I have created one edition to follow M2M developments and another one to share a vision on how to shape the connecting society (Shaping the Connected Society & The #M2M Startup Zone). These have become my default news and BI pages. For the #M2M Startup Zone , I have selected RSS feeds from Blogs, Twitter keywords and a clever selection of filters to make sure I get the latest updates from market shapers and shakers, from partners and competitors. My primary sources here where Telefonica M2M, DT, AT&T, Vodafone, Jasper Wireless, DeviceHive, Arduino, Gemalto and Ericsson Labs to name only a few. The flexibility here comes really from the filtering capabilities and the variety of feeds you can use. You need to play a bit with the sources to make sure you get fresh daily content. Some companies are not very active while others have to much content. Filtering allows you to get a good balance of information between various sources. Paper.li is marketed as an online newspaper publishing and trend monitoring platform but it is so much more when used in a business context. Tech Magazines tend to target a wide audience and often contain a lot of content that is not relevant to me and specialized magazines are often difficult to find. The curated content provided with paper.li provides exactly what I am looking for. Of course none of this will replace ground work done by journalists or analysts, but these have, for me at least, become a secondary source of information. Once I want to dig into further details, I might get that expensive analyst report. 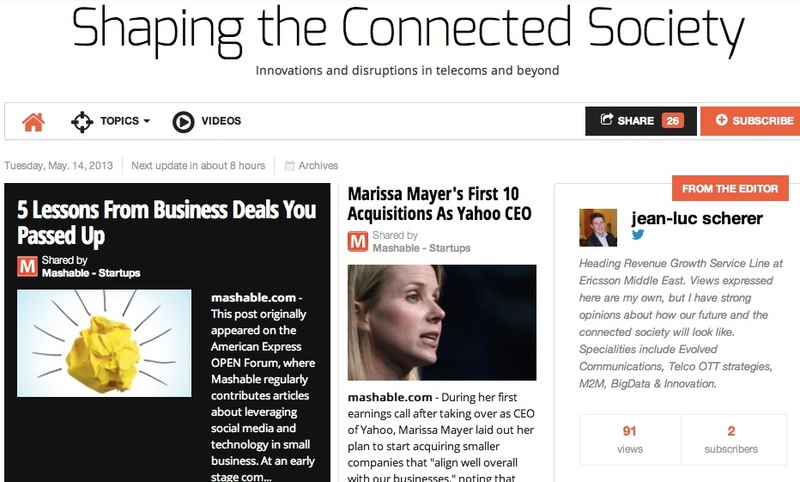 For the first daily paper I created, “Shaping the Connected Society” I have been using twitter feeds mainly, but for some of them like Mashable, the sheer volume of information will fill your paper with only that source. So filtering on keywords was key here as well to get a good balance on the content. I have some of the other tech sources like Techcrunch, Quartz included as sources to this paper and I am quite happy with the result although I feel that the results when focusing an specialized area like M2M tend to be better since the filtering is sharper. Anyway, I strongly recommend this paper.li to anybody that is looking for a good and free tool to get good Business Intelligence platform on almost any topic. Try paper.li and make you own magazine matching you interest and needs, being it technology, sports, food or education, you will easily find your way around this amazing tool. When it comes to bigdata, retail is an industry which is quite mature compared to the ones mentioned in my previous articles, especially if you start looking at companies like Wallmart. The subject of bigdata is already well covered but I hope I can give an additional twist on the current developments by taking M2M into the picture. Wallmart has leveraged bigdata and analytics for a number of years now. The amount of data they collect is already at the level of petabytes and they save information about all of their customer transactions, more than 1 million per hour, and it is mainly related to receipts and purchases. Even with a single source of data, it already provides a lot of insights when properly stored and analyzed. Today, the average retailer in the US has about 700 Terabytes of stored data. This is huge already. Processing this data requires often big investments especially if you want to process the data in real time. But bigdata is not only for big enterprises it can also be offered as a service and a number of service providers are moving into analytics as a service, this will revolutionize the way retailers do business. Connecting the right type of data sources could provide value even for the smallest companies. Most retailers own information collected at the point of sale in terms of receipts, purchases done, but that is not the only valuable source. Using video surveillance cameras to analyze customer behavior or combining information from mobile devices or social media could be other valuable sources. Much of this information comes today from mobile and M2M devices, but that data is often stored in silos and it can be difficult to get actionable insights from this data. I think the key for smaller sized retailers will be to expose their own data assets, get that data enriched and get analytics as a service from specialized service providers. The question is now, how can these insights be used and monetized? A first application of properly processing retail data is to achieve cost savings. Knowing which items are in demand ahead of time and knowing what will sell can help to optimize inventory and supply chains. Utilizing big data could increase retailers’ operating margins by up to 60%, this could include savings in marketing, merchandising as well as supply chain. Looking ahead, I could easily imagine in a not so far future, that bigdata and analytics could also become a means to improve in store customer service. Imagine a clerk in a fashion store that would know as you enter his store what you like in terms of clothes, what you sizes are, what colors you prefer and understands your purchasing behavior, he could serve you faster and better. This would result in more customers served and a better sales ratio. Another application of bigdata is to improve customer loyalty and reduce churn. To continue with the Wallmart reference, they have developed a product that allows them to reach customers, or friends of customers, who have mentioned something online to inform them about that exact product and include a discount. Using social media and combining that with purchasing data and contact information it allows them to implement pro-active measures and hence avoid churn or even attract new customers. This creates loyalty and strenghtens the brand image. Retaining customers has also to do with the experience they get when interacting with the retailer, this is in part achieved by delivering relevant ads, offers, and promotions. Personalizing offers means making offers more revelant to a customer by having specific knowledge of that customer’s profile. Securing increased sales is also related to the ability to rapidly adjust to the competitive environment. Most of us are sensitve to pricing and customers will often look for peer reviews to find the best place and time to buy an item. Being able to quickly adjust to this competitive environment will be key for increasing sales and sometimes even for survival. M2M and mobile devices will play an increasing role in customer profiling. There are today many data sources that are already in digital format and could be used in a big data context. From a retailer context we have customer information, this is often tied to the purchases done in that store through an opt-in loyalty program. Then there are the product catalogues and the actual status of the inventory. The next step in personalization is coming from Mobile Devices, through applications which will let customers specify preferences, provide navigation capabilities to be guided to the right store, get relevant advertising and also get recommendations from other customers on the items they are interested in. I think though that the biggest disruption might come from a smart usage of video cameras (e.g. surveillance camera) and other M2M sensors. Images from cameras in a store could help identifying who you are and support retailers to pul up a full profile of your customer preferences. Most of us tend to trade in privacy for convenience, so I have not doubt that every individual will sooner or later have pictures of himself tagged somewhere on the net and that could be the starting point to pull more information about you as a customer. But there are other mechanisms to identify you as a person as for instance foursquare check-ins or the social media profile you are using when logging to wifi. Location information is going to be quite important to target shoppers. This could be obtained from mobile systems, wifi or tracking from video cameras. Video cameras could also be used to analyze how customers are focusing on different items in the store. This could help understand interest for certain items and maybe also decide when and what to discount. Another application of video camera is for instance to get the right sizes of the customers when entering a fashion store. Digital signage in shopping malls and retail store can also be used to provide tailored messages and personalized ads to shoppers in or outside the store. A few seconds is probably enough to reach out to a shopper with the right message and the impact of the advertisement can probably be measured if the sale is done within the next hour. Digital signage could also be used with cameras to analyze shopping carts and make a last second recommendation on something you might have forgotten to buy. Other smart devices collecting data about users could be smart mirrors, that record reactions when trying out clothes or screens that provide a personalized greeting when entering a store. If I picture the future of retail I would imagine a smart shopping mall where customer experience is at the heart of this business. I would enter the mall and get greeted with a personalized message, the map of the mall would be downloaded to my mobile and I would get a recommendations on a few stores to visit. I would get discounts for the items I been looking for, especially the I have been reading recommendations about on the internet. This would be part of the profile information the mall is pulling up for me. As I walk and watch the digital signs I see more information about the products I am interested in. I enter a shop. The clerk again greets me and guides me directly to the item I am looking for and provides also alternative color options based on my preferences. Not much to ask me since he has all this information on a tablet. As the clerk knows I am price sensitive he gives me an extra discount. If I picture the future of retail I would imagine a smart shopping mall where customer experience is at the heart of this business and where bigdata and analytics provide value at every step . All indicators are pointing in the same direction, our cars are getting connected fast and they will generate loads of data. Axel Deicke, Vice President Aftersales Service Technologies at BMW Group, talks about an increase in incoming data from approximately 20 GB per year (in 2011) to now 30 GB per day – and that is at BMW alone. These statistics exclude information from market research or customer service. In a recent whitepaper from Deutsche Telekom AG,Erol Gökçek, Head of Industry Solutions Automotive & Mobility forecasts that the monthly data traffic per connected car will increase from approx. 4 MB to 5 GB in the next few years. If one accounts for the increasing number of connected vehicles, then it’s clear that data traffic will skyrocket. According to a study conducted by the consulting firm Oliver Wyman, 80 percent of all vehicles sold around the world will be connected as early as 2016. By then, about 210 million connected vehicles will be on the roads worldwide. Compared with 45 million cars in 2011, this would be an annual growth rate of more than 36 percent. So what type of data are we talking about? It is everything… from sensors transmitting information about speed, miles driven, break pad consumption, weather alarms to owner downloaded content. Multiple players are interested in delivering, enriching or harvesting this data. Car manufacturers, Telcos, Cloud providers and analytics companies all see opportunities from these huge amounts of data. For the automative industry there are multiple benefits. Connecting cars is a way for major brands to create a real connection with their buyers, because to be frank this will not happen through the car sales people or car services. Both are usually synonymous to painful experiences. But what if you car would start telling you when it should be taken for service, if it would start warning you about road hazards, or if would automatically download content and car settings that are personalized to current driver. Taking it to the next level you driving profile, car usage could provide you car manufacturer with key insights on when and how to engage you on your next car purchase. Getting relevant car information is not only useful to stay closer to the car manufacturers clients, but also to improve some of the internal processes, especially when it comes to spare parts for repair and maintenance. When it comes to governments they see emerging technologies as great mechanisms to increase road safety and start inforcing this through regulations, which will further enhance the deployment of sensors and embedded connected devices. The EU has for instance passed regulations that will require new cars to have emergency self-braking systems (known as autonomous emergency braking, or AEB). The systems can use radar, laser or video to detect when obstructions or pedestrians are present, and a recent study suggests that the technology reduces accidents by up to 27 percent. Commercial vehicles will have to sport the systems from November next year, and everything else from 2014. The European Commission has also adopted a measure to ensure that by 2015 your car can call emergency services for you in case ofa crash. eCall automatically dials Europe’s single emergency number 112 in the event of a serious accident and communicates the vehicle’s location to the emergency services. According to some estimates, eCall could speed emergency response times by 40% in urban areas and 50% in the countryside, and save up to 2500 lives a year. The measure adopted on 26 November 2012 establish the conditions under which the emergency call response centres will be capable of properly rece iving and handling of 112 eCalls. Enabling Vehicle-to-vehicle communication is another way of transferring key safety information with a pre-emptive objective. A car suddenly breaking because of a fog bank or a car standing still on a highway are important pieces of information for another car driving in the same direction. Telefonica has come quite far within their digital services unit. They have managed to position themselves in complete new values chain, in particular in the car insurance value chain. Telefonica has signed a partnership with insurance company Generali, in Spain, in order to provide detailed driving behavior data enabled by their insurance telematics solution. In the Telefonica solution a device is installed in the vehicle and sends every minute the following collected driving information to the Telematics Platform via GPRS communication: Kilometers driven, Harsh braking and acceleration events, Speeding events, Time and date, Type of the road. For more information on the business models, and additional value propositions please read the original telefonica whitepapers. AT&T is another pioneer in theconnected car business, and AT&T’s vision crosses multiple value chains, from safety provider, to car infotainment provider as securing preemptive maintenance notifications. 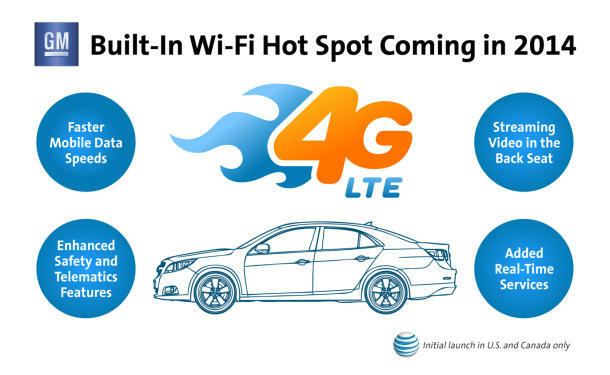 At this years Mobile World Conngress AT&T and General Motors had announced a partnership to sell 4G LTE-connected cars in 2014. The AT&T approach seems to focus on providing a complete eco-system around the connected car concept with the operator at the heart of different value chains. Ericsson & Volvo are working on a similar Connected Car vision where the car is connected to the cloud and becomes a portal for different types of end-user services. A main screen will provide access to all services from navigation, to safety, maintenance or infotainmet. Volvo cars will be equipped with a control center that will tie together third-party providers such as internet radio, road authorities, governments, toll-road operators, and others. A prototype was also demoed at the 2013 MWC. To be frank, I believe this is only the beginning. Right now car manufacturers focus on connecting their cars as a differentiation for their brand and most of the insights are gathered from car-based measurements only. But soon you will need somebody that can combine data from multiple cars, analyze that data collected and gain new insights. This is an additional opportunity for operators. In addition to earlier mentioned car collected data, their are other sensors and source of information that could be combined with the original data. Information from traffic lights, air pollution sensors could provide additional insights on how to optimize traffic lights or improve urban planning. Car data and car driving patterns could even be used to understand where there is lack of parking places and you could probably even infer the number of spots missing with the right analytics tools. Possibilities for value creation are endless but this will require consolidation of M2M solutions and regulations so that data can be shared in a safe and reliable way. This post is part of a series of 5 posts that I intend to write on how M2M and Bigdata are made for each other. I will start with covering the benefits in HealthCare industry and then address Automotive, Utilities and Retail. In the final post I will go through some of technology requirements needed to properly address these opportunities. This is the start. Connected devices are becoming ubiquitous to out daily lives, whether it is consumer devices like smartphones or smart TV’s, everything else is becoming smart as well, and everything is somehow connected to the global cloud. This applies also to most enterprise equipment. 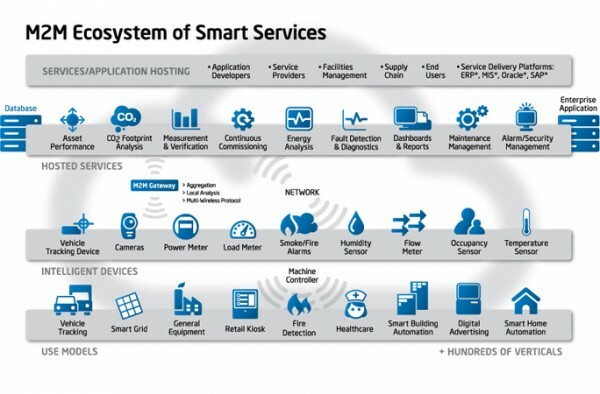 From smart meters, to smart cars, ehealth devices, everything that benefits from a connection is today getting one. The data generated by these connected devices is skyrocketing. In its report “The Digital Universe in 2020, IDC, a market analysis firm, predicts the amount of data produced by connected devices will grow to 40,000 exabytes by 2020. M2M is the biggest source of the data that will be generated in the coming years. Much of the data produced by connected devices will be unstructured and gaining insights from this data will need a different approach than what we get from conventional databases and traditional analytics tools. Gaining actionable insights from the huge amount of data will be a key success factor for any company. With the right insights it will be easier to create value to a specific value chain. And with the right insights at the right point in time, service providers can get closer to their customers, companies can reduce cost, improve efficiency, deliver upon the needs and expectations of their customers. In the long-run better insights means improved competitiveness. Digitalization has already lead to disruption in current value chains as we have for instance seen it with the music industry. Similarly bigdata will have a huge impact on current value chains. Companies embracing big data opportunities will gain a competitive advantage in the value creation game and will also use that to enter brand new markets. So let’s start to have a look at what these opportunities are and why bigdata is key. Healthcare is probably one of the most interesting areas both due to the amount of data generated as well as the opportunities it creates. From reducing healthcare costs to improving life quality the opportunities are real. It is estimated that by 2015 the average hospital will generate about 665TB of data. 80% of this information will be unstructured data in the form of videos, images and emails. The amount of data is huge and untapped. To put things in perspective a single CT scan represents about 1GB of data, while an X-ray takes about 30MB. Doctors around the world would benefit from instantly accessing patients records, comparing it with other patients. Soon the analytical tools to mine this data will be there. The opportunities are in predictive medicine and preemptive measures. Predictive medicine will allow earlier and better treatment. Comparing data which is normally contained in different silos, will allow doctors and hospitals to infer new insights and improve the decision process. For instance, people genetically predisposed to certain diseases will get faster diagnosis and more accurate treatment. It will be possible to better asses the risk profile of patients and hence better understand the optimal time to release a patient from the hospital. According to a Mc Kinsey report up to $70 billion could be saved by otpimizing discharging timings in hospitals. Monitoring different patient behaviors could also help doctors to recommend pre-emptive actions to avoid future illness or complications. Now with all this data nee ded to better process patient treatments and the increasing connectivity requirements between patients, doctors and hospitals, their is an opportunity for telco’s to play a major role in healthcare. Orange is probably one of the best examples of how an operator has successfully managed to take a major role in healthcare. They are today providing data centers to doctors and hospitals to instantly share patient records including all imagery, they are working with hospitals to improve efficiency by improving supply management and are optimizing flow of patients by automatically delivering orders to staff and supporting vehicles. Orange is also providing telehealth solutions to improve the interaction and communication with patients. The next level of value creation for telco’s will be the ability to create additional value through analytics as a service. Now beside the genetic predisposition to certain diseases, the lifestyle and activity a person performs has also a lot to do with how that person’s health develops. So how much information can we actually capture about these habits and behaviors that could really affect our health, and how much of this are we actually sharing with our physician? Sport brands and Fitness companies are probably among the first that recognized this. 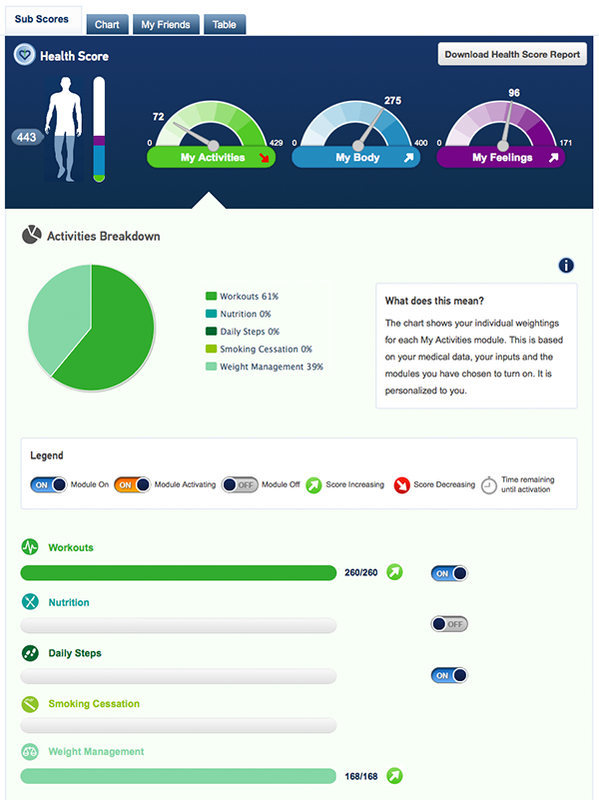 From Nike fuelband to fitbit, which boht started measuring fitness activity, there is now a whole range of companies that have gone beyond and have the ambition to become every consumer’s health and fitness partner (see for instance health score application from dacadoo.com on the left). Sensors, self-testing devices are becoming reasonably priced and people start investing in their own health through technology rather than relying only on the existing healthcare system. I wouldn’t be surprised if in a few years from now a big part of the healthcare industry goes over the top. As an individual I might be investing in a number of monitoring devices, that will give me real insights on my health and might even give me more accurate diagnosis than my local physician, since I cannot lie to a device. When connecting all of this information to the cloud, by identifying patterns and similarities between different users, a lot of insight can be collected and recommendations can be given, maybe even for free. If I am a device vendor/sensor vendor, I might just do this to boost sales of devices. This is similar to the approach apple has taken with its ipod and itunes and has that way disrupted much of the music industry. One example of how such approaches could replace some of today’s approaches is food allergies. Proper allergy tests are still damn expensive but by recording for instance what i eat, how I feel, and comparing that with other patients records and foods databases, I am pretty sure you could infer mild form of allergies and treat them in time and with better quality. This philosophy or starting to measure everything about yourself and sharing it in exchange of advice is pretty much at the heart of the quantified self movement. Quantified self is an interesting trend since it means that individuals are investing time and money to monitor themselves with the ultimate goal to improve their quality of life. Finally, medical records, tests made, genetic profile could also be overlaid with earlier mentioned lifestyle related insights: combined with fitness levels, food consumptions, spleeping patterns or even mood or feelings could provide even more insights if analyzed and mined properly. So in ten years from now who will be your first choice for healthcare? My best bet is that it will be whoever gives me the best insights on what my health is, gives truly personalized advice and treatments, and interacts with me in a way that conveys both trust and empathy. With global connectivity and emerging cloud services, this provider does not necessarily need to be local. Global connectivity and cloud means that the cost of providing diagnosis will fall and that might lead to traditional boundaries for healthcare slowly falling. National and regional Healthcare providers will have to step up to the challenge and probably join forces with Telco’s to stay competitive. If they don’t then movements like Quantified Self will sooner or later create the “Skype” or “Whatsapp” of the healthcare industry.